Hibiya Park (日比谷公園) is located in Kasumigaseki, Tokyo. There are ponds, Japanese gardens, and flower gardens which many people works around this park visit here for their break times. In August, there is Bon Odori festival called Marunouchi Ondo. Marunouchi Ondo is one of the biggest Bon Odori Festival in Tokyo. There is cafe and restaurant in this park. This area held the estate of Matsudaira Hizen-no-Kami and others until the fall of Tokugawa Government, and was military parade ground through the Meiji era. 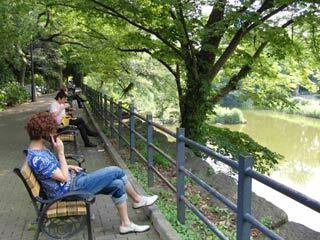 It was later planned, designed , and developed as an urban park, becoming Japans first western modern park.Enthusiasm of the park designers who were pioneers of culture can be seen in the large and small outdoor music halls and public hall. The parks flowerbeds are blooming with colorful seasonal flowers year-round.